The sunny weather and stunning seaside scenery make this an ideal place for rest or holiday activities. Surrounded by blue waters of the Baie des Anges and looked over by the foothills of the Alps, nice has a pleasant mild climate year round. Considered the center of the French Riviera, Nice is a perfect starting point to discover the city and the surroundings. Consider renting a cheap car to relocate yourself in this area. Nice, one of the largest cities in France, is filled with lots of attractions for visitors. The city has something for everyone, from historical monuments to play areas for the children. Tourists can choose car rental as their main means of transportation and get around all the attractions quickly and easily. The hotels and apartments in the Nice are ideal for most people. There are luxury hotels which provide world class facilities as well as the budget hotels which are well known among the tourists for superb hospitality. The major attractions of the city include the Marc Chagall National Museum, the Monastery Garden, the Musée des Beaux-Arts, the Orthodox Cathedral and many more. History enthusiasts who have opted for car hire will find plenty of places to visit. This clean and green city has a lot of things for all age groups. Those who love to visit museums can see the Marc Chagall National Museum, which is dedicated to the works of teh famous artist and is a home for many works by the legend including 17 large Biblical Message paintings. The Musée d'Art Moderne et d'Art Contemporain is the gallery where visitors can see works of Warhol, Lichtenstein and other famous artists. In addition, there is the Musée des Beaux-Arts which is also popular with art lovers. France is famous for its artists and no matter where you choose to go with your car rental service you will be able to find examples of their works. The Côte d’Azur is a paradise for fun lovers. This is one of the most popular places in the whole of Europe when it comes to yachting. The nightlife of this place is simply amazing and tourists can have a great time in the exclusive bars, restaurants and boutiques of this stunning city. There is a beautiful park in the city named the Monastery Garden, which is famous for its 19th century appearance and elegant beauty. Tourists are able to enjoy beautiful views of the city from here. Pack a picnic and make use of Nice car hire and head towards the greener areas of the city. The Musée Massena and the Musée Matisse are two beautiful places explaining the glorious history of Nice. In addition there is the Musée d’Histoire Naturelle which is a natural history museum that is well-known as the home of more than a million botanical, zoological and geological specimens. Make the most of cost-effective car hire and explore the city as much as possible during your stay, taking in these and other attractions for a holiday to remember. Be advised that car rental companies block a certain amount on your credit card to cover any unforeseen fee’s like traffic fines or toll fee’s. If a car rental company is Off Airport the supplier will provide a free of charge shuttle bus to the local rental office. When traveling to Nice we advise to carry some Euros to avoid any unwanted surprises.At Nice Airport there are Money Exchange offices in order to change your local currency. The local time code for Nice is CEST. When traveling to Nice make sure to check the local weather conditions in order to avoid any unpleasant surprises. Nice has approximately 343,895 inhabitants. In many cities and countries you have toll roads, most toll roads you can pay with cash or with your credit card, however some car rental companies offer electronic toll devices, depending on the car rental agent the price this toll device is included in the rental price or not, in the detailed terms of each car rental agent you can find this information. The electronic toll device allows automatic payments of all fees due for passing through any electronic toll barrier, when you arrive at the car rental desk you can activate this toll device and the toll expenses will be automatically paid in your credit card. Parking your rental car in Nice Airport can best be done in a garage. Its safer for you and your rental car. There might be the possibility to park your rental car in the outskirts of Nice Airport and move around by public transportation which is not too expensive and will compensate for the parking fee you will need to pay if parking in the city center. Take in mind that many big cities have a city center only accessible for locals or delivery purposes. Last month, the average car rental length at Nice Airport was 8 days. The average rental car length at Nice Airport is 6 days. The most booked rental car type currently at Nice Airport is INTERMEDIATE cars. Last year, the most booked rental car type at Nice Airport were COMPACT cars. How much does it cost to rent a car at Nice Airport? Last month, the average car rental price was 259 USD. Last year, how much did it cost to rent a car at Nice Airport? Last year, the average car rental price was 265 USD. 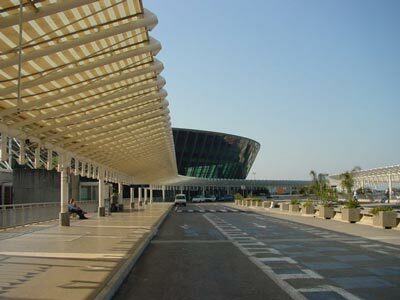 What is the current average daily price to rent a at Nice Airport? Last month, the average rental price was 34 USD per day. How much did it cost to rent a car at Nice Airport over the past 12 months? Last Year, the average rental price was 47 USD per day. The car rental companies available at Nice Airport are: Alamo, National, Firefly. See below last 5 customer reviews. Our customers rated Nice Car Rental with an average of 9.33 based on 3 ratings.